In an unusual move, NVIDIA took the opportunity earlier this week to announce a new 600 series video card before they would be shipping it. 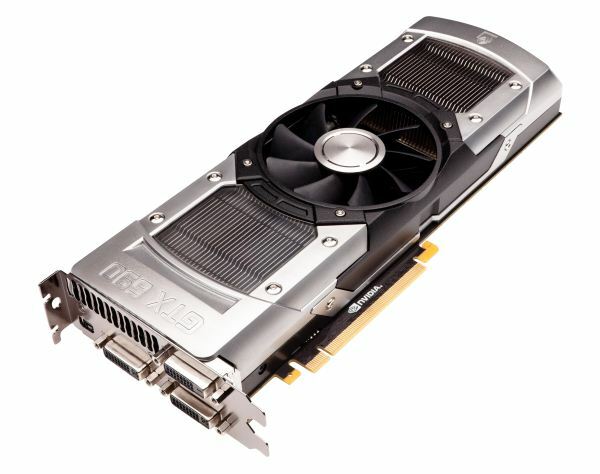 Based on a pair of Kepler GK104 GPUs, the GeForce GTX 690 would be NVIDIA’s new flagship dual-GPU video card. And by all metrics it would be a doozy. Packing a pair of high clocked, fully enabled GK104 GPUs, NVIDIA was targeting GTX 680 SLI performance in a single card, the kind of dual-GPU card we haven’t seen in quite some time. GTX 690 would be a no compromise card – quieter and less power hungry than GTX 680 SLI, as fast as GTX 680 in single-GPU performance, and as fast as GTX 680 SLI in multi-GPU performance. And at $999 it would be the most expensive GeForce card yet. After the announcement and based on the specs it was clear that GTX 690 had the potential, but could NVIDIA really pull this off? They could, and they did. Now let’s see how they did it. As we mentioned earlier this week during the unveiling of the GTX 690, NVIDIA is outright targeting GTX 680 SLI performance here with the GTX 690, unlike what they did with the GTX 590 which was notably slower. As GK104 is a much smaller and less power hungry GPU than GF110 from the get-go, NVIDIA doesn’t have to do nearly as much binning in order to get suitable chips to keep their power consumption in check. The consequence of course is that much like GTX 680, GTX 690 will be a smaller step up than what NVIDIA has done in previous years (e.g. GTX 295 to GTX 590), as GK104’s smaller size means it isn’t the same kind of massive monster that GF110 was. In any case, for GTX 690 we’re looking at a base clock of 915MHz, a boost clock of 1019MHz, and a memory clock of 6.006GHz. Compared to the GTX 680 this is 91% of the base clock, 96% of the boost clock, and the same memory bandwidth; this is the closest a dual-GPU NVIDIA card has ever been to its single-GPU counterpart, particularly when it comes to memory bandwidth. Furthermore GTX 690 uses fully enabled GPUs – every last CUDA core and every last ROP is active – so the difference between GTX 690 and GTX 680 is outright the clockspeed difference and nothing more. Of course this does mean that NVIDIA had to make a clockspeed tradeoff here to get GTX 690 off the ground, but their ace in the hole is going to be GPU Boost, which significantly eats into the clockspeed difference. As we’ll see when we get to our look at performance, in spite of NVIDIA’s conservative base clock the performance difference is frequently closer to the smaller boost clock difference. As another consequence of using the more petite GK104, NVIDIA’s power consumption has also come down for this product range. Whereas GTX 590 was a 365W TDP product and definitely used most of that power, GTX 690 in its stock configuration takes a step back to 300W. And even that is a worst case scenario, as NVIDIA’s power target for GPU boost of 263W means that power consumption under a number of games (basically anything that has boost headroom) is well below 300W. For the adventurous however the card is overbuilt to the same 365W specification as the GTX 590, which opens up some interesting overclocking opportunities that we’ll get into in a bit. For these reasons the GTX 690 should (and does) reach performance nearly at parity with the GTX 680 SLI. For that reason NVIDIA has no reason to be shy about pricing and has shot for the moon. The GTX 680 is $499, a pair of GTX 680s in SLI would be $999, and since the GTX 690 is supposed to be a pair of GTX 680s, it too is $999. This makes the GTX 690 the single most expensive consumer video card in the modern era, surpassing even 2008’s GeForce 8800 Ultra. It’s incredibly expensive and that price is going to raise some considerable ire, but as we’ll see when we get to our look at performance NVIDIA has reasonable justification for it – at least if you consider $499 for the GTX 680 reasonable. Because of its $999 price tag, the GTX 690 has little competition. Besides the GTX 680 in SLI, its only other practical competition is AMD’s Radeon HD 7970 in Crossfire, which at MSRP would be $40 cheaper at $959. We’ve already seen that GTX 680 has clear lead on the 7970, but thanks to differences in Crossfire/SLI scaling that logic will have a wrench thrown in it. But more on that later. Finally, there’s the elephant in the room: availability. As it stands NVIDIA cannot keep the GTX 680 in stock in North America, and while the GTX 690 may be a very low volume part due to its price, it requires 2 binned GPUs, which are going to be even harder to get. NVIDIA has not disclosed the specific number of cards that will be available for the launch, but after factoring the fact that OEMs will be sharing in this stockpile it’s clear that the retail allocations are certainly going to be small. The best bet for potential buyers is to keep a very close eye on Newegg and other e-tailers, as like the GTX 680 it’s unlikely these cards will stay in stock for long. The one bit of good news is that while cards will be rare, you won’t need to hunt across many vendors. As with the GTX 590 launch NVIDIA is only using a small number of partners to distribute cards here. For North America this will be EVGA and Asus, and that’s it. So at least unlike the GTX 680 you will only need to watch over two products instead of a dozen. On a broader basis, long term I have no reason to doubt that NVIDIA can produce these cards in sufficient volume when they have plenty of GPUs, but until TSMC’s capacity improves NVIDIA has no chance of meeting the demand for GK104 GPUs or any of the products based off of it. While the basic design of the GTX 690 resembles the GTX 590, NVIDIA has replaced virtually every bit "with plastic with metal" for aesthetic/perceptual purposes. surely "with plastic with metal" to "of plastic with metal"
1st line on page 2 "Much like the GTX 680 launch and the GTX 590 before it, the first generation the first generation of GTX 690 cards are reference boards being built by NVIDIA"
If you look at accumulated benchmarks across the web, the 680 Nvidia cards beat the 7970 amd cards by a much higher percentage in 1920x1080 (17.61% ahead) than they do in 1920x1200 (10.14% ahead). This means anand reviews always tests in 1920x1200 to give the amd cards a prettier looking review, instead of testing in 1920x1080 (the most commonly available resolution at 1920x that they could easily set their 1920x1200 monitors to). Hence their tests here at anand are likely also amd favorably biased in higher resolutions.